In 2007, the Nordic EMBL Partnership for Molecular Medicine was founded as a collaboration between EMBL and FIMM (Institute of Molecular Medicine Finland) at the University of Helsinki, MIMS (Laboratory for Molecular Infection Medicine Sweden) at Umeå University, and NCMM (Centre for Molecular Medicine Norway) at the University of Oslo. The collaboration with EMBL aimed to bring their biomedical research to a more international level by raising the profile of their institutes, creating state-of-the-art infrastructures and recruiting excellent scientists from around the world. The Nordic EMBL Partnership agreement was renewed for a further 10 years in 2013, and a fourth node, the Danish Research Institute of Translational Neuroscience (DANDRITE), at Aarhus University, joined the Partnership. Each node brings a broad and unique set of expertise that is complementary to EMBL’s research, ranging from molecular mechanisms of disease, microbial pathogenicity and molecular infection to genetic epidemiology and neuroscience. In the past few months, three of the four nodes welcomed new directors. 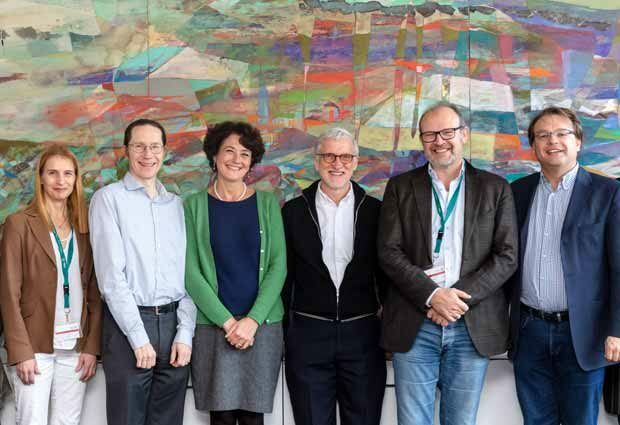 Here, Oliver Billker, Director of MIMS; Mark Daly, Director of FIMM; Janna Saarela, Director of NCMM; and Poul Nissen, Director of DANDRITE, discuss their vision for the Nordic EMBL Partnership and the benefits of working collaboratively across borders. What do you hope to achieve in your role as Director? Oliver Billker: My role is to foster the groundbreaking research of our group leaders, and to help further their careers. Umeå University and the departments that host our group leaders have a very strong reputation in infectious disease research, and I look forward to building on this and ensuring that it carries on well into the future. Mark Daly: I would like to see all of our outstanding research areas continue to work towards clinical relevance. For example, I would like to see further development of the collaboration between our cancer groups at FIMM and the Helsinki University Hospital Comprehensive Cancer Center. I also hope that the genetic information and the information we are able to obtain from drug screening and imaging can eventually be used to make healthcare decisions. Janna Saarela: I hope to strengthen collaboration opportunities with hospitals and other local stakeholders within Oslo and Norway. I also hope to develop and promote NCMM towards becoming a major player on the worldwide map of molecular medicine, and also build its profile as a centre that has a translational mindset and a team-oriented working culture. Poul Nissen: I hope we can get a properly funded research exchange programme going, preferably including a joint postdoc programme similar to the EMBL EIPOD scheme. Furthermore, I think we are now seeing several emerging EMBL partnerships for Molecular Medicine, for example in the Netherlands, Hungary, and Poland, which will also provide good opportunities for us to engage with many other centres across Europe through EMBL’s network – something that I think will become increasingly important. How do you plan to work together with the other Nordic EMBL Partnership Directors? Janna Saarela: In November 2018 all of the Nordic EMBL Partnership directors met at EMBL in Heidelberg, and we had some great and concrete discussions about ways that we could increase collaboration between the nodes and with EMBL. We are meeting also in September 2019 for the EMBL Partnership Conference hosted by EMBL Barcelona. I hope that we will be able to work more closely together in the future. Poul Nissen: Perhaps it’s time to consider some interest groups in EMBL’s greater European partnership programmes for molecular medicine – for example in areas such as cancer, diabetes, inflammation, or neuroscience. The Nordic EMBL Partnership can be a strong component in most of these areas. I think we could find a lot of common ground for more collaborations and joint working here. What does the Partnership with EMBL mean for you? Oliver Billker: Umeå is a lively university city in the beautiful north of Sweden. It is somewhat on the periphery of Europe, but thanks to our EMBL partnership this is only true geographically. By working closely with our Nordic partners and other institutes in the EMBL family, we have a direct link to other centres of excellence in research, which is important for the flow of ideas and learning from each other. Mark Daly: We have goals to initiate projects on an EU scale, not just on a Finnish scale, so working more closely with EMBL would help with this. It would have great value in terms of credibility, funding opportunities, and in terms of convening groups that need to be part of a joint activity. We should also look to utilise our Nordic EMBL affiliation to reach out to the wider EMBL network, and to use this to develop ideas that could help advance the research in our field quite significantly. Janna Saarela: The partnership and links with EMBL provide NCMM additional international visibility, which can be extended on a national level to also benefit other Norwegian universities. Following the EMBL model for recruiting young group leaders, which is based on scientific excellence, enables NCMM to attract international talent. This also gives them an even greater opportunity to develop as group leaders and scientists with a secured funding package and to integrate within the research environment. This provides them with future career opportunities, while at the same time providing brain-gain to national research and society. Poul Nissen: I think we could particularly benefit from making more use of EMBL’s Core Facilities, and also consider joint training opportunities for young researchers, as well as through large European research initiatives like the ERC Synergy Grants and other network grant activities that address particular challenges. Furthermore, the EMBL affiliation has a tremendous impact on our recruitments and science evaluations – the EMBL brand brings us a lot of credibility and visibility. What is the Nordic EMBL Partnership? More than 600 researchers and other staff, from more than 60 countries. 63 group and team leaders. Total funding of around €50m, including core and extramural funding.